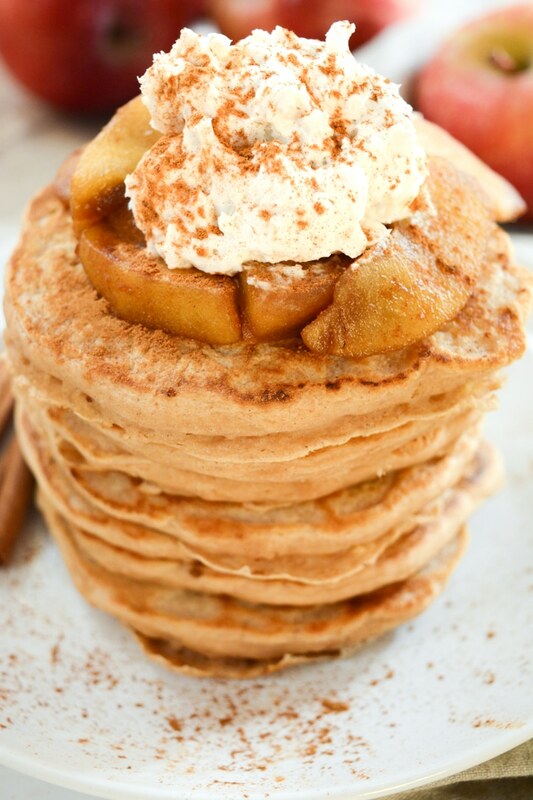 Apple Cinnamon Pancakes are like having dessert for breakfast! 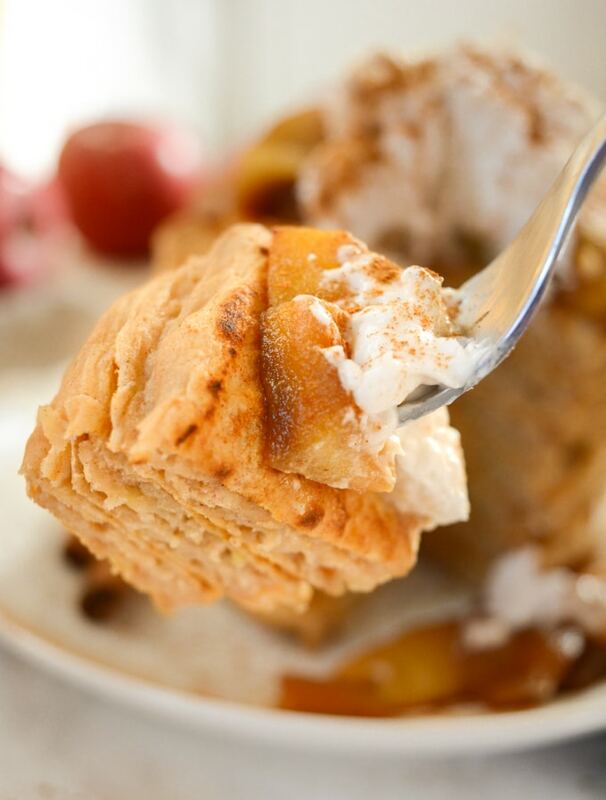 The cinnamon-apples & sweet whipped topping make these an irresistible vegan breakfast! Everyone will be asking for more of these egg & dairy free pancakes. Breakfast is a meal that can satisfy the sweet and/or salty morning cravings. For a quick, grab-n-go breakfast, a loaf of sweet vegan banana bread never disappoints. But, sometimes a 3 course breakfast is in order. 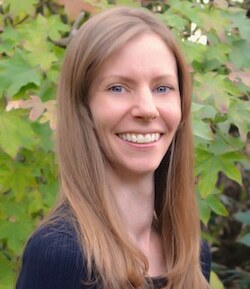 I’m taking about–– tofu scramble, apple cinnamon pancakes and breakfast potatoes. 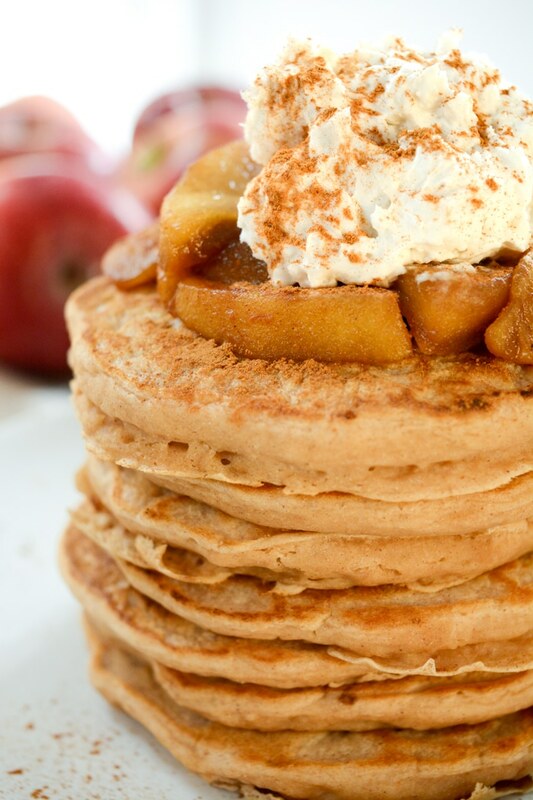 Why should you make these soft & fluffy Apple Cinnamon Pancakes? 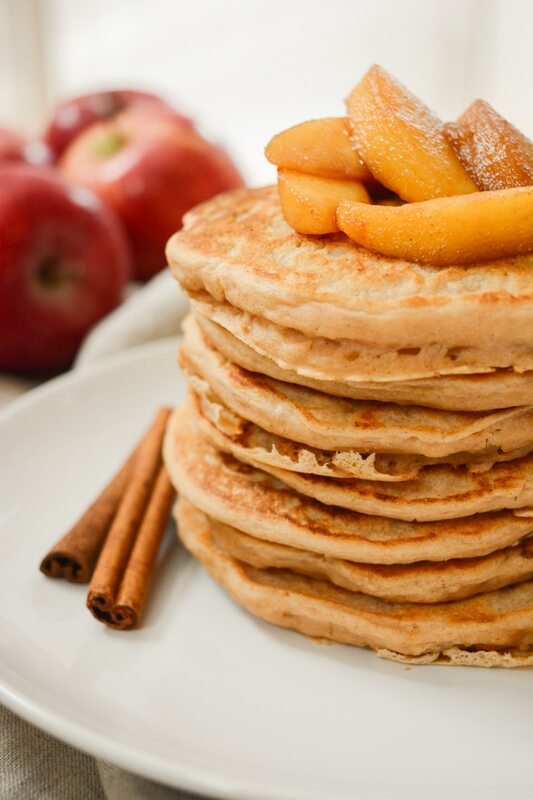 Well, the batter is filled with grated apple giving these pancakes an added natural-sweetness and apple-y taste! Then, they are topped with cooked apples, a sweet coconut whip and drizzled in maple syrup! The decadent toppings make these the *ULTIMATE PANCAKE EXPERIENCE*! However, you can always go classic by leaving off the extra toppings and covering them in only maple syrup. 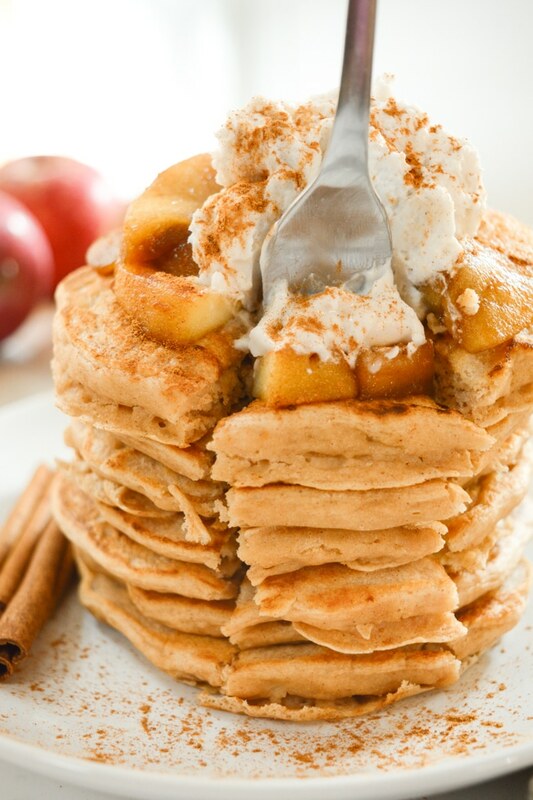 Apple-Cinnamon Pancakes are really easy to pull off! It only takes 1 bowl and about 5 minutes to whip up the batter. Now, pour the batter and make some fluffy pancakes. 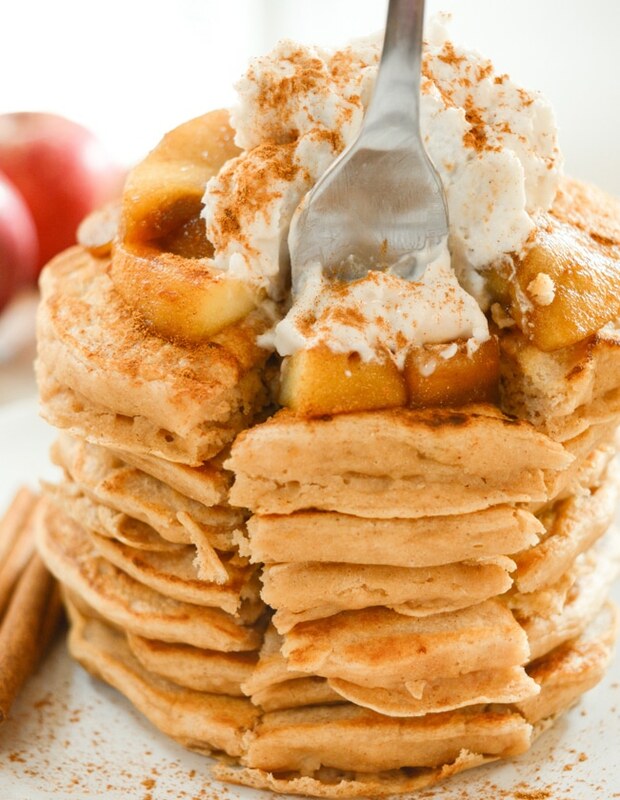 Apple-Cinnamon Pancake toppings are just as easy to prep! Since the toppings are so easy to prepare, I like to make them first! For the apples, just add all the ingredients to a saucepan and heat until they are softened. This takes about 10 minutes or so. While the apples cook, mix up the coconut whip. Add all the ingredients to a large bowl. With a hand mixer, whip until the cream is stiff yet fluffy. Store the coconut whip in the refrigerator until the pancakes are ready to be topped. If you would like extra whip and apple topping just double the recipes! 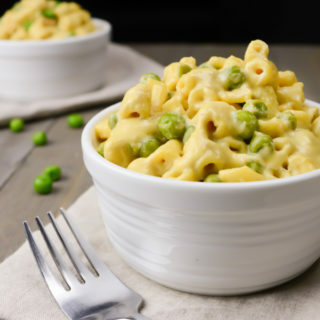 If you make this recipe, rate it and to tell us what you think below! Also, be sure to snap a photo and share it with us! We love to see your creations! You can find us on Pinterest, Instagram and Facebook. 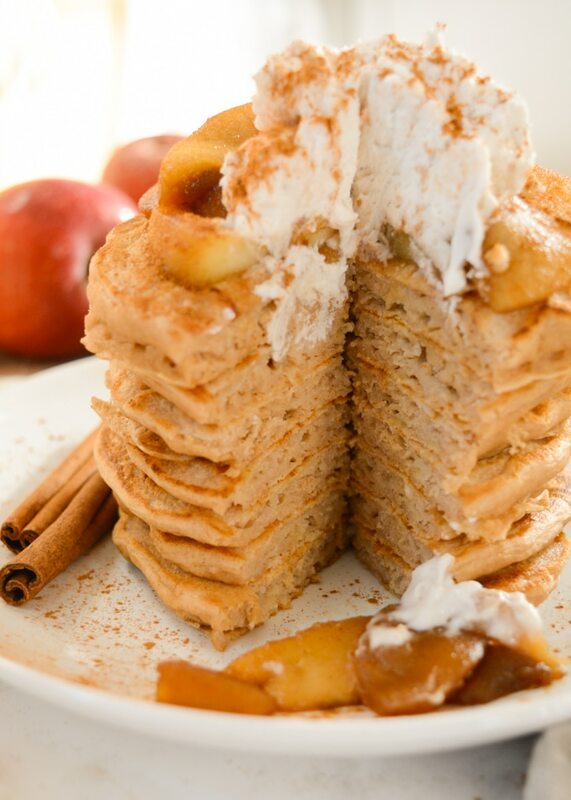 Vegan Apple Cinnamon Pancakes are topped w/ cooked cinnamon apples & sweet coconut whip. It's like having dessert for breakfast! Egg & Dairy Free pancakes! Heat a pan or large griddle over medium-high heat. In a large bowl sift the flour. Add-in the remaining dry ingredients. Pour the wet ingredients into the bowl of dry. Gently whisk until the batter is just combined. Don’t over mix, lumps are OK! Brush a bit of oil on the pan and pour about 1/4 cup of batter down. Flip the pancake once the edges appear slightly cooked and small bubbles form on top. Cook on the other side until lightly browned. Serve immediately or keep warm in a 150ºF preheated oven. Add toppings or top with maple syrup. To Freeze the Pancakes- place parchment paper between each pancake. Store in an air-tight container or bag. Keeps for about 2-3 months. Place all the ingredients in a small saucepan. Heat over medium-low until apples have softened. Place a can of full fat coconut milk in the back of the fridge overnight. Carefully open the can and collect the cream on top. Place all of the ingredients in a large bowl. Using a hand mixer , whip the ingredients until the coconut cream becomes smooth. Taste and adjust sweetness if needed. Stack desired amount of pancakes on a plate. Add cooked apples to the top of the stack. Add a generous dollop of coconut whip to the top of the apples. If desired, drizzled with maple syrup. **How to make Powdered Turbinado: Blend turbinado sugar into a powder then measure out 2 Tablespoons. I have made many kind of pancakes before. 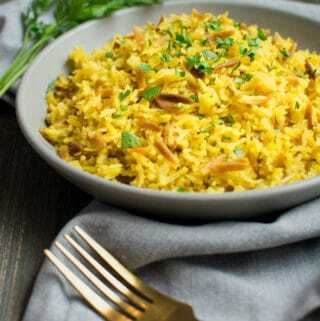 This is the best recipe that I made. Thank you thank you! We had a great breakfast with of my boyfriend and with your super super delicious pancakes. 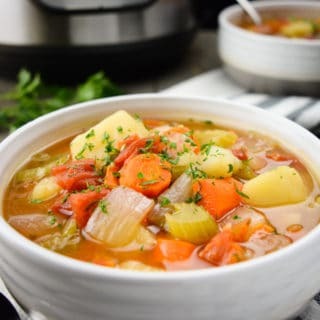 Wonderful recipe full of beautiful seasonal flavors. The pancakes look so fluffy and light although they are egg and dairy free. The toppings also blend so well together and give the pancakes a sophisticated feel.